The 55-year-old slammed reports that there is a breakdown in communication with the club’s all-time top scorer. REAL MADRID COACH Rafael Benitez is tired of reports suggesting a rift with superstar Cristiano Ronaldo, calling the claims in the Spanish media “lies”. 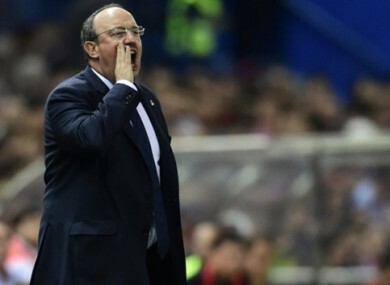 Benitez has repeatedly been the subject of stories claiming he has a difficult relationship with the Portuguese forward since he took over the reins of the Bernabeu club in the summer. However, the Spanish coach is sick of rumours of a rift, claiming they are the invention of members of the media who have an agenda against his outfit. “There are good journalists and others whose interests are against Real. We all make mistakes but not like the false news reported,” Benitez told esRadio. Ronaldo — who became Madrid’s all-time leading goalscorer at the weekend versus Levante — has also seen his relationship with team-mate Gareth Bale questioned, but Benitez is having none of it. “Cristiano and Bale get along just fine,” the 55-year-old continued. “The most important thing in all this is that they have a common goal — to help Real win. “The biggest advantage of having a player like Cristiano is that he gives you 50 goals a season. Los Blancos are the top-scoring team in the league with 18 goals, and Benitez has denied criticism that he is too defensive after leading his team top of La Liga. “I’m a defensive coach, they say, but when [we] state the numbers of shots on target and goals, that is forgotten,” he responded. The Spanish capital outfit are unbeaten this season, and will look to extend their perfect start to the Champions League campaign when they travel to face joint Group A leaders Paris Saint-Germain on Wednesday. Email “Benitez rubbishes 'lies' about Ronaldo relationship”. Feedback on “Benitez rubbishes 'lies' about Ronaldo relationship”.